Slide into the season at San Diego’s exclusive holiday adventure park. Create a new family tradition with an exhilarating ride down a two-story 100-foot ice slide and take a spin in an ice bumper car. Toast s’mores, sip festive cocktails, and marvel at a spectacular interactive light show. Gather loved ones for sweet and savory fare and delight in activities of the season from stocking trimming to cookie decorating. Re-discover the magic of your youth at Holiday by the Bay. Barrel down an exhilarating two-story 100-foot ice tubing slide overlooking the bay! Sure to thrill adults and kids alike, this breath-taking attraction is included with admission to the event and can be enjoyed all evening long. Based on availability. Must be 40” or taller to ride. 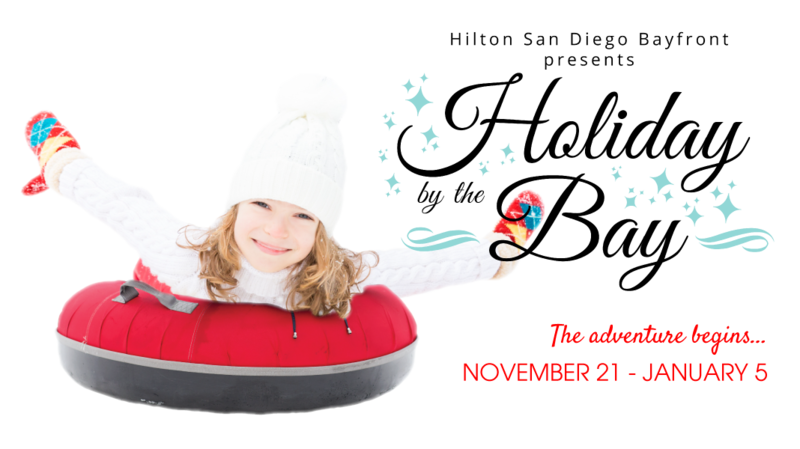 Hop in for a wild spin on an ice-bound bumper boat! A surprising winter twist on an old family favorite – a smashing good time for everyone. Head to Santa’s Stable to try your hand at taming one of his new reindeer-in-training. Hang on tight! The bucking brute is known to pack a punch and may not be fit to guide his sleigh just yet. Based on availability. Must be at least 6 years old to ride. Settle into Mrs. C’s Kitchen, possibly the coziest place to enjoy a favorite holiday tradition. Decorate freshly baked gingerbread and sugar cookies and write a letter to Santa or our Troops. Discover the magic inside Santa’s Workshop! Trim your very own stocking, slide into a giant present, squeeze through an elf door for a mini adventure, and travel like Santa, through the chimney of course! Take in captivating hourly light shows featuring snow flurries around the 30’ Christmas tree. Celebrate the season at the rustic signature bar. Imbibe specialty craft holiday cocktails or venture on a festive small batch whisky, craft beer or champagne flight. Spring for a coveted Fireside Lounge. Roast s’mores and toast the season by hosting your own private soiree at one (or all) of these exclusive Yule Lodge patio perches. Each Fireside Lounge features a private firepit, lounge seating for up to 8 guests with a perfect view of SHINE Holiday Light Spectacular. A $50 Food & Beverage Minimum is required. Menu coming soon. For more information, email info@hiltonholidaybythebay.com. Does not include admission to the event. All guests of the Fireside Lounge must have an admission ticket for access. Gather the family for casual festive fare at Elven Eatery, splurge on sweet treats from Kringle Bakery or stop by Nutcracker Suite for a savory snack and sip something warm at Dasher’s Coffee & Cocoa. Menus Coming Soon! Extend your Holiday by the Bay experience with one of our exclusive hotel packages featuring discounted admission to the attraction plus additional activities inside the hotel including Breakfast with Santa, Christmas dinner, holiday movie nights, Naughty or Nice mixology classes, 12 Days of Bliss at the spa and more! Valid November 21, 2018 through January 5, 2019. November 21, 2018 – January 5, 2019TICKETS ON SALE NOW! The adventure begins November 21st! Is there an ice rink this year? Holiday By the Bay does not feature an ice rink this year. Instead, we are introducing a brand-new attraction and the only one of it’s kind in San Diego – Reindeer Run, a 100’ long ice tubing slide. How many times are we allowed to go down the Reindeer Run Ice Slide? Your ticket to Holiday By the Bay allows you to go down the slide as many times as you would like to and are able to based on lines and wait times. What are Activity Tickets and how much do they cost? Activity Tickets are used to access the Iceberg Bumpers, Klaus Kitchen (gingerbread and sugar cookie decorating), Santa’s Workshop (stocking trimming). Each activity ticket costs $3 and they can be purchased at Holiday By the Bay. How much does it cost to trim stockings at Santa’s Workshop? Can I use my ticket on a different day? Yes. You can exchange your ticket for a different day at the Box Office by paying a $5 Date Change Fee. What should I wear to go on the ice slide? We recommend long socks and pants that cover the knees. Gloves and a hat are recommended as it can be windy down by the bay. Do you have lockers? Where do I put my belongings? We currently do not have lockers. Please note that Holiday by the Bay is not liable for any lost or stolen property. Can my child wear a helmet? Of course, extra protection is always a good idea. Holiday by the Bay does not provide helmets, but please feel free to bring your own. Are there any special events or offers? Does the disabled community have an opportunity to participate in Holiday by the Bay activities? How much does it cost to decorate a gingerbread or sugar cookie at the Klaus Kitchen? Cookie decorating requires 3 Activity Tickets (Cost: $9) and includes 1 cookie as well as frosting and candy to decorate with. How much does it cost to ride the Iceberg Bumpers? The Iceberg Bumpers require 2 Activity Tickets (Cost: $6). When can I come to Holiday by the Bay? Your ticket is valid at any time during operating hours on your selected date. Do Hotel Guests receive a discount? Hotel guests do not receive a discount on Holiday by the Bay activities. We are pleased to offer $5 Off to Military and their families. If I don’t purchase my tickets online, can I still get tickets at the event? YES. But please note that online ticket purchasers save $5 on the Box Office price, so we encourage our guests to buy online and save. Want to book a holiday party, birthday party, or private engagement? Please contact Aileen Babayan, Assistant Director of Events & Catering, at info@hiltonholidaybythebay.com or +1 619 321 4272.